A new bipartite begomovirus (family Geminiviridae) was detected on cowpea (Vigna unguiculata) plants exhibiting bright golden mosaic symptoms on leaves under field conditions in Brazil. Complete consensus sequences of DNA-A and DNA-B components of an isolate of the virus (PE–088) were obtained by nanopore sequencing and confirmed by Sanger sequencing. The genome components presented the typical genomic organization of New World (NW) begomoviruses. Pairwise sequence comparisons revealed low levels of identity with other begomovirus species previously reported infecting cowpea around the world. 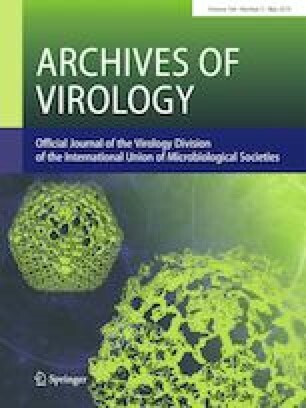 Phylogenetic analysis using complete sequences of DNA-A components revealed that the closest relatives of PE–088 (85-87% nucleotide sequence identities) were three legume-infecting begomoviruses from Brazil: bean golden mosaic virus, macroptilium common mosaic virus and macroptilium yellow vein virus. According to the current classification criteria, PE–088 represents a new species in the genus Begomovirus, tentatively named as cowpea bright yellow mosaic virus (CoBYMV). The online version of this article ( https://doi.org/10.1007/s00705-019-04254-5) contains supplementary material, which is available to authorized users. This research had financial support from grants from Embrapa, CAPES, CNPq and FAPDF (Grant nos. 407908/2013-7, 312646/2018-6). FLM, CAFS, BMR and LSB are CNPq fellows.